Have you ever wanted to experience a destination or an activity but were too scared to step outside your comfort zone? I’ve avoided ski resorts my whole life because everything about them is unfamiliar to me. Now that I’m a mom, I see that having fun and making memories (even if it means feeling unsure of myself and making dumb mistakes) is a risk worth taking; I’m determined to overcome my fear of ski resorts one wintery adventure at a time. As luck would have it, snow is falling early on Tahoe this year and ski resorts are opening early! 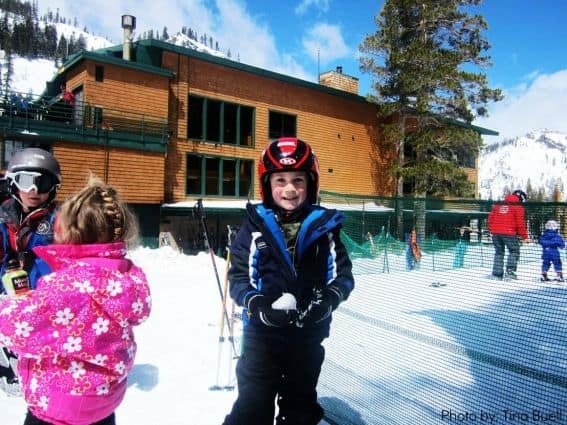 There are 11 family friendly North Tahoe ski resorts. Last year, I visited three. It doesn’t sound like much, but trust me, it took me all winter and it was an adventure! When choosing between the ski resorts of North or South Lake Tahoe, I lean north. North Lake Tahoe ski resorts are accessible from I-80, making the drive less intimidating than the drive along Highway 50; I-80 is cleared of snow constantly by the California Department of Transportation and Highway 50 tends to be mostly a two-lane, winding, twisty road. TRUE STORY: I drove home from Tahoe with snow chains on dry pavement! Not only did I ruin a perfectly good pair of snow chains, I ruined a perfectly good front fender! Lucky for me, this year North Lake Tahoe will offer a free Ski Shuttle December 22 through March 31, 2013 during peak season on weekends and holidays. 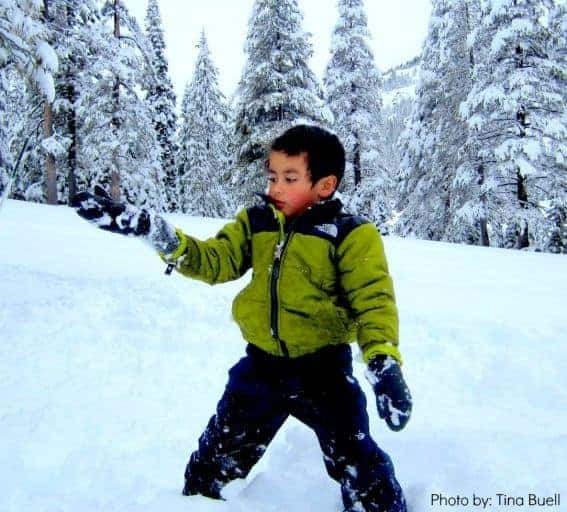 Once in North Shore, families can leave their cars and catch a ride to Squaw Valley, Alpine Meadows, Northstar California, Homewood Mountain Resort, Diamond Peak, Sugar Bowl, Donner Ski Ranch, Boreal, Soda Springs, and Royal Gorge Cross Country. 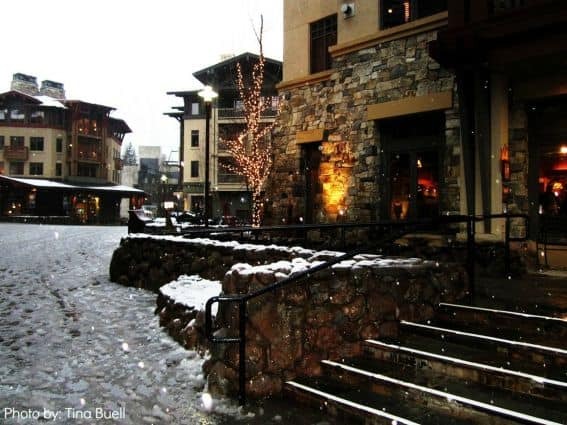 An overnight stay in the Village at Squaw is a luxurious experience. The Village offers condominiums ranging from studio suites to 3 bedroom floor plans. These upscale units feature bathrooms with heated floors, balconies overlooking the Village, gas fireplaces, and designer kitchens. Currently, a two bedroom suite with a view is $186 a night. On December 22, Resort at Squaw Creek launched a new restaurant. Mountain Pizzeria offers casual Italian fare in a relaxed slope-side environment. The pizzeria will be open all season for lunch and Après ski events from 5pm to 7 pm, featuring guest DJs, drink specials, giveaways, and complimentary transportation to and from the base of Squaw Valley. The resort’s ski-in, ski-out chairlift to Squaw Valley, provides speedy access to more than 6,000 acres of terrain at Squaw Valley and Alpine Meadows. Visitors also can experience cross-country skiing, snowshoeing, dog sled tours, horse-drawn sleigh rides and an on-property ice skating rink. PlumpJack Cafe’s kid-friendly, gourmet breakfast buffet is dynamite! Their selection of house-made pastries won me over at first bite. In fact, the morning after I ate here, I found myself wishing I could magically transport my family back for more. After experiencing their killer breakfast, I’m chomping at the bit to stay at Plumpjack Squaw Valley Inn to experience the café’s dinner! 22 Bistro is a sophisticated family-friendly restaurant in the Village. TRUE STORY: After my kids finished eating here, they hopped out of the booth and started dancing. You know the food is good when it inspires you to dance! The view of KT-22 from the entrance is breathtaking. Be sure to stop and admire it on your way in. For desert, I enjoyed the greatest bread pudding known to man. If you visit 22 Bistro and you do not order the bread pudding, you will have missed out on an earth shattering experience. 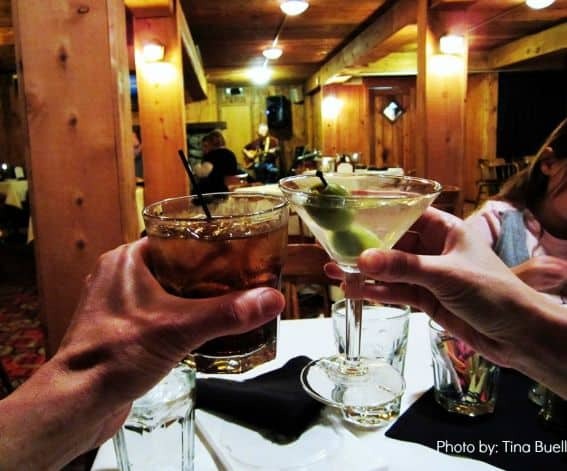 Squaw Valley’s Fireside Pizza Company is the perfect place to gather with your loved ones for a casual dinner. Fireside is known for its delicious salads and gourmet pies. Crowd favorites include the Thai Red Curry Chicken pizza and The Pear and Gorgonzola Pizza. For those who are gluten intolerant, Fireside offers gluten free crusts! Rocker@Squaw is the cool kid on the block. Located across from 22 Bistro, Rocker’s exterior is gorgeous. Inside, Rocker features televisions, a full bar, a slamming menu (the burgers are bomb), computer stations, a fun wall of children’s artwork, and a ridiculously fun atmosphere. What makes Rocker truly unique is that anyone can upload their helmet cam footage at the bar and watch it on the big screen. On Sunday’s, Rocker shows the best of best video footage from each week’s submissions. If you like sushi, you’ll love Mamasake. The outside is painted a flirty shade of red, the inside décor is hip, and its mouthwatering food transcends the age barrier. Watching my kids drink Miso Soup not only warmed their tummies, it also warmed my heart. (I’m so tired of watching my son eat Chicken Fingers and Fries!) Next door, there’s a candy/yogurt shop with cute outdoor chairs shaped like ice cream cones! Flanking Mamasake’s other side is a giant wooden chair. It’s the Village’s version of a roadside oddity and fun for kids to climb. Bring your camera! Cornice Cantina is a small restaurant with a full bar that’s open till 2 am. I’d compare this fun neighborhood hangout to Cheers. Except there’s a shiny disco ball hanging from the ceiling which makes it even cooler! Cornice Cantina offers a wallet-friendly kids menu and televisions. Sandy’s Pub, at Resort at Squaw Creek, wants to make you fat and happy. Shhhh, you didn’t hear it from me. Does it get any better than a weekend of family snow play, food that sticks to your ribs, frosty cold microbrews, and catching the game on one of many big screen televisions? Sandy’s Pub doesn’t think so! Upstairs from Sandy’s, Six Peaks Grille is a family-oriented upscale steak and seafood restaurant located within Resort at Squaw Creek. My 4 oz. Filet Mignon was so tasty, I cleaned my plate. Heck, I almost ate my plate! The specialty cocktail menu is the best I’ve seen. For dessert, I ordered a Mayan Coffee since I’d recently returned from Cancun a few months prior! Other fun drinks include a Coconut Martini, a Key Lime Martini, and a Blood Orange Margarita. Yum! If you’re not able to make it for dinner, swing by for desert and a cocktail. 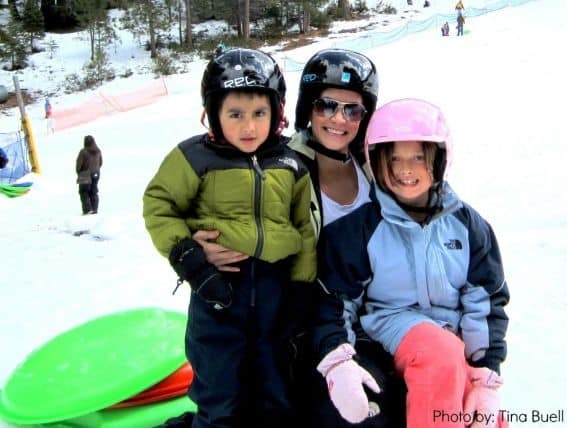 I took my family Snow Tubing at SnoVentures and it was a blast! The highlight of my day was when my son fell asleep sitting in his tube riding the magic carpet to the top of the tubing lane. What’s a mom to do? I pushed him down the tubing hill asleep! Kidding! I pulled his tube off to the side and let him nap in it while I enjoyed tubing on my own for an hour before waking him up. SnoVentures also offers kids ages 6 to 12 mini snowmobiles and a groomed mini snowmobile course. 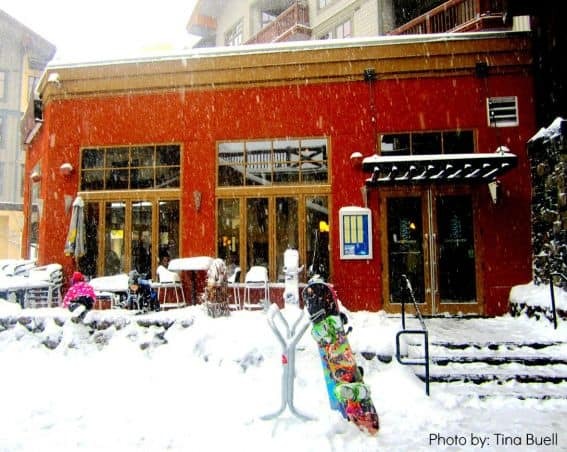 Fun Fact: Squaw Valley has completely remodeled its Olympic Plaza Bar and added a shiny new retail store called Parallel Mountain Sports that offers kids gear as well as adult gear and attire. On the mountain, Squaw has installed three new lifts at its mountaintop beginner/intermediate area. Alpine Meadow’s Kids Camp is a safe and exciting place for children to learn the fundamental skills they’ll need to become a capable skier or rider. For parents who wish to watch their children in class, a staircase near the registration desk leads to an outdoor upper deck. Kid’s Camp programs include lift ticket, lesson, rental equipment, and helmet. Families are allowed to keep their rental equipment until the end of the day. My son’s ski class was located right outside the kids camp registration desk, making it easy for me to keep an eye on him. I’ll definitely be enrolling my son in this class again. 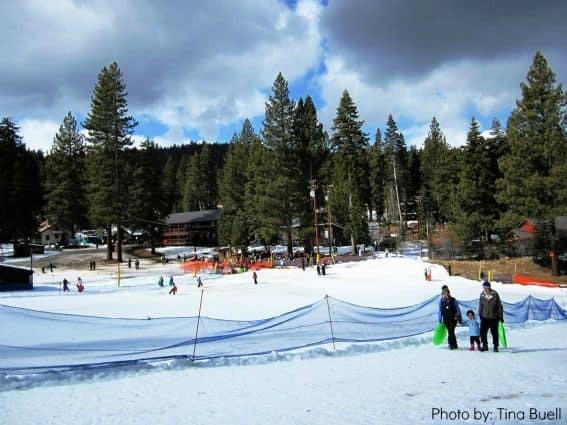 Other fun activities include Kids Lessons at Squaw, Dog Sledding, Snow Shoeing, Ice Skating at the Olympic Ice Pavilion, Aerial Tram Rides, and the Sky Jump. Read more reviews of Squaw Valley. * Lift ticket can be swapped for equipment and use of the trails at Tahoe Cross Country Center or a $65 spa credit toward services at Granlibakken’s onsite Lighthouse Spa. Non-skiers pay an extra person charge of $27 when sharing the same room with two skiers, this rate includes breakfast. Children under 7 are free of charge; kids above the age of 8 are charged the non-skier fee. 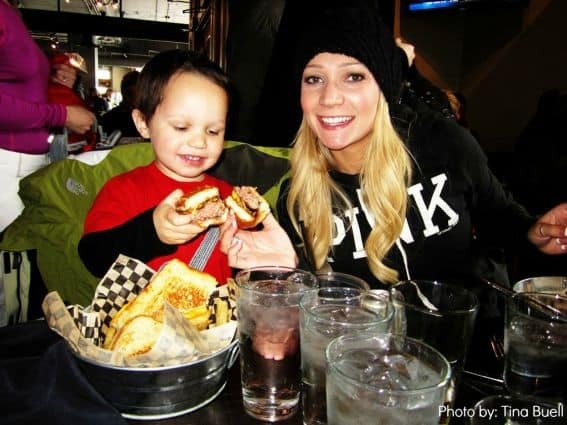 Cedar House Pub is a great place for the whole family to relax and mull over the day’s events with great food, tasty drinks, and live entertainment. Children receive kids menus, crayons, coloring sheets, and a laid back atmosphere in which they can be themselves. Cedar House was just what my family needed after spending an afternoon sliding down plastic saucers at Granlibakken’s Sledding Hill. I ordered the Chicken Schnitzel and devoured it like it was my job! Granlibakken’s Ski Hut Snack Bar is run by two talented women who cook up delicious house-made authentic Mexican dishes. The prices at the Ski Hut Snack Bar were so reasonable they brought tears of joy to my eyes. I ordered nachos, chili, steak soft tacos, and a hot dog for a fraction of the cost of what I would have paid at Heavenly’s Tamarack Lodge. I literally mean 1/4th of the cost! My checkbook jumped out of my purse and kissed me on the cheek! Granlibakken’s Sledding Hill is machine-groomed, large enough to thrill adults without striking fear in the hearts of children, and is a close walk from the parking lot. Helmets are recommended and can be rented at the Ski Hut Snack Bar. You won’t need to withdrawal a large chunk of cash from the ATM before you arrive because the cost for saucer rental and use of Granlibakken’s Sledding Hill is only $10 a day!! Other fun activities include kids ski lessons, Cross-Country Skiing and Snowshoeing, an intimate ski hill for beginning through intermediate skiers and snowboarders, and a new Tree Top Adventure Park that’s open year round! Thank you to Resort at Squaw Creek, The Village Squaw Valley, Squaw Valley Ski Resort, Alpine Meadows, and Granlibakken for making my wonderful adventure possible. Though my trips were complimentary, the opinions expressed in this article are my own. Special thanks to Pettit Gilwee Public Relations for supplying me with up-to-date North Lake Tahoe Recreation Updates.